Features – For Carriers - Saloodo! can I use the platform? does the Saloodo! dashboard work? can I contact the service team? do I organize my transport orders? can I keep track of my documents? can I assign transport jobs? Register as a carrier to benefit from all the features listed below. A correct VAT ID and up-to-date company documents are mandatory to complete the registration and to verify your account. Subscribe to our newsletter for the latest product updates, features or promotions. There are more than 10,000 shippers adding their transport requests on Saloodo!. We give you access to different types of shipments, from which you can choose according to your preferences, routes and truck capacities. Find transports from individual pallets to full loads. As a digital freight platform, we are data-driven but we also understand the value of human interaction. We know that a call placed at the right moment can save a lot of time and costs. We want to make sure you feel comfortable to call and ask for help whenever it’s needed. It has never been easier to handle your operational processes. You get instant access to transport orders, proof of delivery documents and transport invoices. The information remains available on the platform at any time. Saloodo! pays you within 14 days once the POD documents have been confirmed. No more lengthy price negotiations or unreliable payment processes to hinder your daily workflow. With Saloodo! you benefit from fast and secure payment. 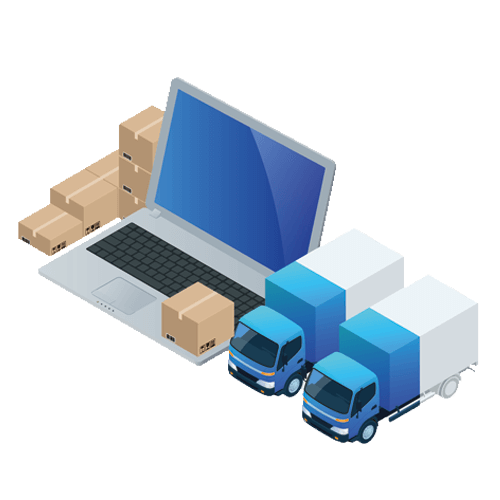 Addresses submitted incorrectly or incomplete order details can create challenges during transport. To avoid these type of situations, Saloodo! oversees the overall communication and acts as your single point of contact. Are you looking to assign transport jobs to your driver or simply to find out how to upload documents? Our dedicated team will support and assist whenever you need help. You can find our Live Chat function on the right side of our homepage. As a contract partner, we want to ensure trust and transparency – all while helping you expand your customer base, locate freight and optimize your truck capacity. We simplify the communication between the consignor and the logistics department and also between you and the driver. Do you have the truck capacity and the interest to find more loads? Then create your Saloodo! account for free. Register, upload up-to-date company documents and get access to thousands of transport requests on your routes. 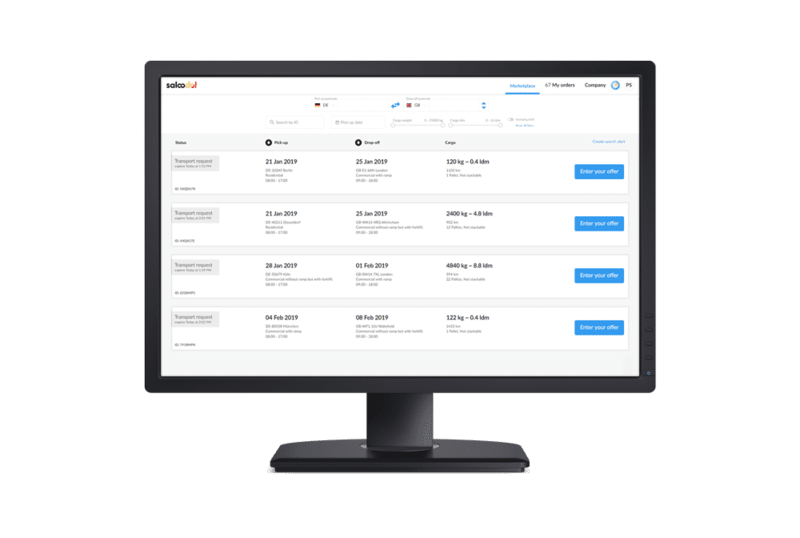 Get an instant overview of your transport requests and completed orders. Our dashboard allows you to suggest offer prices based on real-time market data, set trade lanes and filter requests based on your transport preferences. Simplify your daily operations by inviting your coworkers to work with you on Saloodo!. This helps you find more transport requests on different routes. Use this function for free to create your own workflow. Looking for shipments in your area? The search function helps you filter transport requests by countries, postcodes, pick-up date, the cargo type, and dimensions. Tip: enter a full postcode (ex:”50679′)’ to narrow down search results or the first two digits (ex:”50”) to reach a wider area. With Saloodo!, you now have the possibility to save time and fuel costs by transporting combined shipments at multiple locations. Choose transport requests on your routes to optimize your truck space and complete more orders. This arrangement allows the goods to be transported easier and more secure. We automated the process of creating offers, so you can have the flexibility of providing your own pricing, dates and routes. The rate cards can be configured depending on parameters such as maximum weight and dimensions, creation date or offer validity time. Additionally, we will inform you as soon as your transport offer gets booked. With Saloodo!, you get access to your personalized archive. Simply click on ”Archived orders” view the timeline of your past transport orders, download transport documentation or simply check your previous routes. Search alerts can save you time and they’re easy to set-up. You can create them for any of your preferred routes. Once created, they will be automatically stored. On the ”Search alerts” page, you can access all your previously saved alerts and choose how you want to be notified. The offer cancelation feature allows you to withdraw an offer posted during the submission period. This is especially useful if you want to submit a more competitive offer or simply to correct a typing error. In other words, you can cancel the initial offer and replace it with a new one. 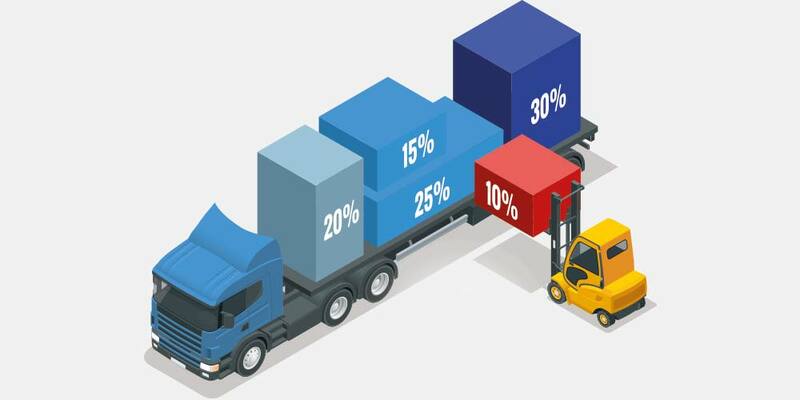 Before you submit a binding offer, our transport price calculator will show you if your offer price is attractive, average or not competitve in comparison with other orders booked on Saloodo! This way, you can adjust your offer price to real-time market conditions and increase your chances to secure more orders. 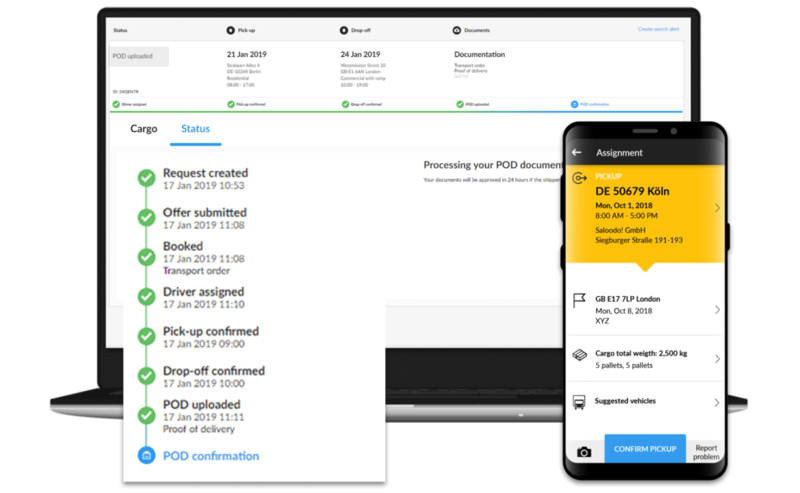 See and access the transport requests that match best to your requirements directly on your Saloodo! dashboard. We only recommend shipments that are relevant to your criteria so you can always submit competitive offers. Simplify your transport tasks with Saloodo! all the transport orders from pick-up to drop-off. No more paperwork. Access and manage all the documents directly on your dashboard. Your driver can ause the integrated app scanner to upload the POD documents. This means that all the relevant documents are immediately available for you to download at any time. The Saloodo! Driver app is free to use. The app allows you to assign transport jobs to your driver, plan truck routes and get real-time status updates. By using the app, your driver can confirm the pick-up & drop-off time as well as scan and upload the POD documents. With Saloodo!, you stay informed about the current status of the transport. From pick-up to drop-off, you get real-time status updates that inform you in the event of delays or in general, any status changes. This gives you the security and transparency you need to process your transport order correctly. Activate your browser alerts to get notified directly when there is a new transport request matching your saved searches. We will send you emails when new documents have been uploaded to the dashboard, so you can always keep track of your transport. Activate the Saloodo! browser notifications and don’t miss any important information. Whenever a new transport request has been added on your route or if there are any new updates – you will be the first to know. You will get notfiied via emails on a regular basis if new transport requests have been posted or if your offer has been selected by the shipper. This gives you the security and transparency needed for the correct handling of your transports. Our customers are the focus of everything we do. Our customer service team provides support throughout the entire shipment process. Hand us your transport tasks and we will take care of the rest. The driver app helps you assign transport jobs directly to your driver and to plan routes at an early stage. Get real-time status updates and always stay informed on delivery notes. Assign transport jobs to your driver in real-time. Add their contact details (such as name and telephone number) on the platform. The driver will get the information about the transport job directly on his phone. The driver can scan and upload the POD documents directly on the app. An integrated document scanner will allow him to upload the documents at the drop-off location. This way, the documents will be shown on the dashboard and the process will speed-up your payment. The driver can check the available truck parking spots on his route. The list of parking spaces can be filtered depending on his needs. For instance, the app will display the closest services in his area, such as fuel stations, shower places, internet hotspot, etc. Click on the link we send in the text message to download the Driver App for free. Create an account and get access to the list of transports jobs assigned to you within seconds. Access the assignment list to find more information about the transport jobs, report pick-up & drop-off times and upload the POD documents on the spot. If the driver has a problem during the pick-up or drop-off of a shipment, he can report it in the app. This feature also gives the driver the possibility to call the shipper or carrier (if they provided their phone number on the platform). The problem reported by the driver is then displayed to the carrier and shipper in the shipment status on the platform. 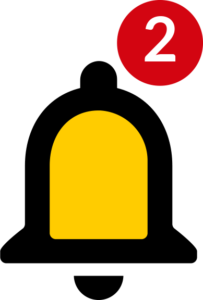 The driver can set his current or recurrent routes directly in the app. Based on this, Saloodo! will suggests transport requests that match his trade lanes. The driver can also add more than one vehicle to his profile. As a result, he will receive more suggestions for shipments depending on the measurements of the trucks listed.